On July 11, 1979, the town of Boone celebrated the dedication of what was then hailed as the world’s largest windmill. 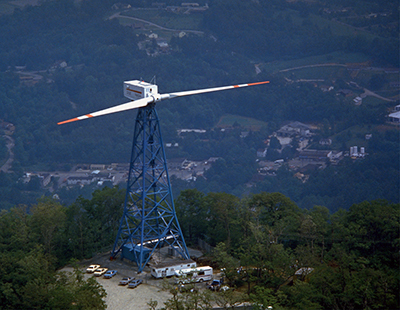 The windmill, perched atop Howard’s Knob, had been installed as part of a program by NASA and the U.S. Department of Energy to develop wind power as a renewable energy source in response to the country's dependence on petroleum during the 1970s OPEC oil embargo and resulting gasoline shortages. The project was an experiment in megawatt power wind turbine design. And the Boone test site was selected, among more than 60 sites, for the promise of steady winds at around 25 miles per hour to generate upwards of 2000 kilowatts of electricity, reportedly enough to power 500 homes. The mammoth steel structure, with its propellers supplied by Boeing and generator by General Electric, stood at 140 feet tall with an open tower, spanned 200 feet wide across the blades and weighed in at around 350 tons. Costing approximately $6 million, the project was administered by NASA under the recently created Federal Wind Energy Program and operated locally by BREMCO (the Blue Ridge Electric Membership Corporation) to return the power to the energy grid. The Boone windmill was part of NASA's Mod-1 series, built during the 1970s. July 11 was celebrated as “Windmill Day,” with a downtown street festival that included craft vendors, music and performers. According to news accounts, tourists jammed the downtown streets and, unfortunately, winds were only at about 6 miles per hour that day, requiring manual rotation of the propeller blades. The lack of wind on the dedication day was a harbinger of the fate of the project. The structure was plagued with significant structural issues within the first two years of operation and winds were inconsistent for optimal energy generation. At times winds never consistently reached or maintained optimal speeds, and at other times they were too strong for the structure. And although the site atop the 4,396 foot Howard’s Knob would become a Watauga County public park built around the tower, the windmill was plagued by negative public perception. This came from complaints from nearby residents about the wooshing and thumping sounds it made to complaints of disrupted television reception. NASA responded to the complaints by removing the original engine and replacing it with a 1.5 megawatt generator. Administrators also suspended activity during primetime television viewing. In January 1981, numerous bolts in the engine’s drive train failed, beginning the project’s rapid descent into closure. With costly repairs reportedly beyond NASA’s reach and federal dollars for wind energy research drying up during the Reagan Administration, the federal government auctioned the windmill in 1983. It was purchased by McBess Industries in Lincoln County for $51,600. The company used the generator for a power plant and reportedly donated the tower to Georgia Tech. McBess donated the propeller blades to the Forsyth County Nature Science Center (later renamed SciWorks). They were displayed outside the entrance for several years until they were damaged and reportedly sold for scrap. Although the project was regarded by many as a failure and waste of public dollars, scientists learned valuable lessons about design for wind power. Today industrial windmills can be found along the Appalachian Mountains from New York into the South. NASA Mod-1 wind turbine in Boone, NC. Photograph. December 31, 1978. Wikimedia Commons. https://en.wikipedia.org/wiki/NASA_wind_turbines#/media/File:NASA_Mod_1_... (accessed June 10, 2016). A friend and I stopped by the site on a motorcycle trip through NC. It was a rainy foggy day and we could barely make out the generator housing which looked like a railroad boxcar up on the tower. It sure had a short life.